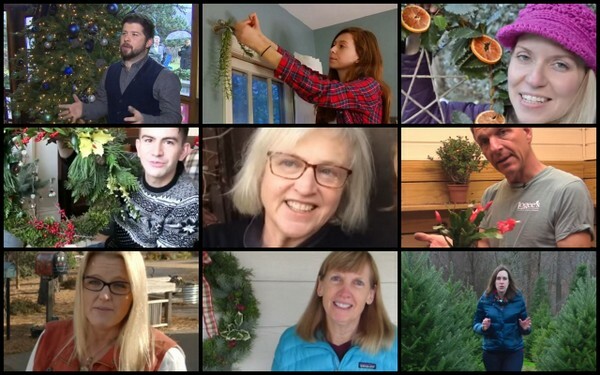 I recently searched on YouTube for “Christmas decorations with natural materials” and found a bunch of crafty people in the U.S. and England. This confirmed my assessment that I’m not one of them. 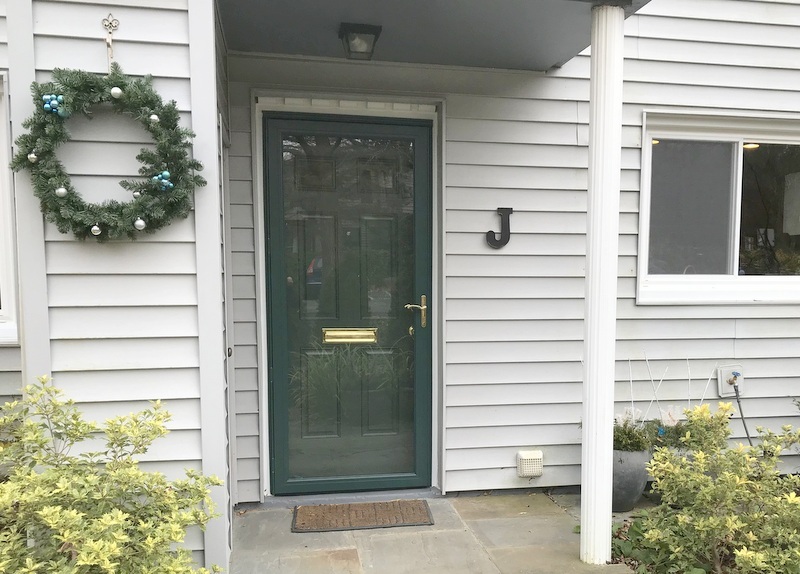 This is as “Christmasy” as my front door will get this season. My goal is really decorating for the winter, so I use colors that don’t look like they need to go away on New Year’s Day, like red always does. I like blue, with a bit of silver. In mid-winter I’ll replace the Juniper bits, and leave it all there until March. 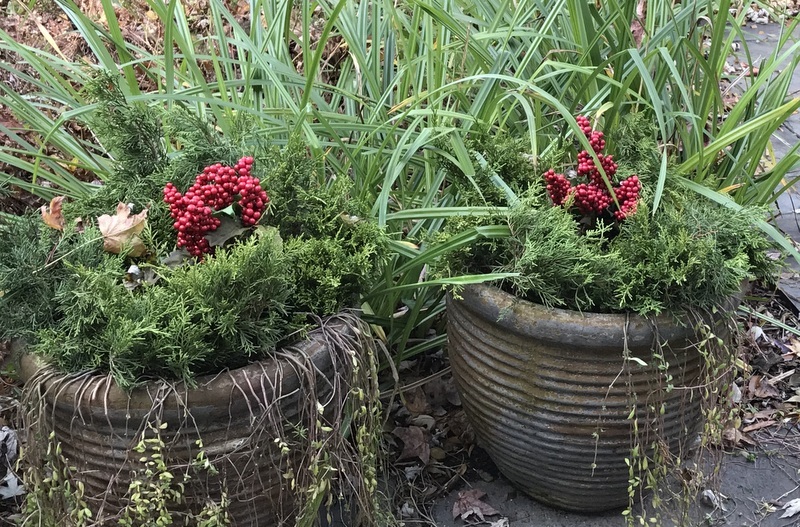 In these pots next to my front door, where my favorite Iresines once dazzled, I use Juniper clippings with bits of possibly tacky extras from a craft store. 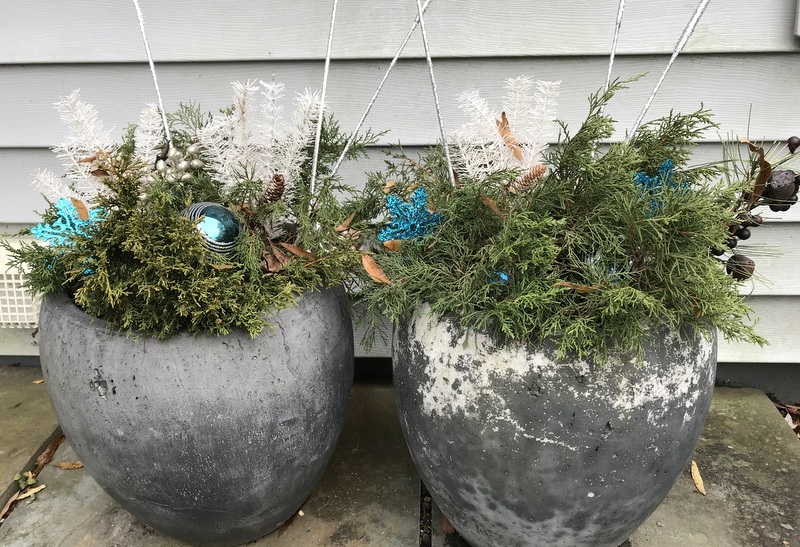 In my back yard, where the pots hold a different color of Iresine all summer, I’ve used blue ornaments and some natural stalks of something or other that have been sprayed silver. I’m not thrilled with this combo. Indoors, I do even less decorating – hanging another possibly tacky doodad above this quilt in the dining room. Above the TV in the living room I hang a wreath, which could use a little more color, I think. I do like the way it looks with the birch tree stencil. By now you see why I welcome your easy decorating ideas – as long as they don’t require talent in floral design. 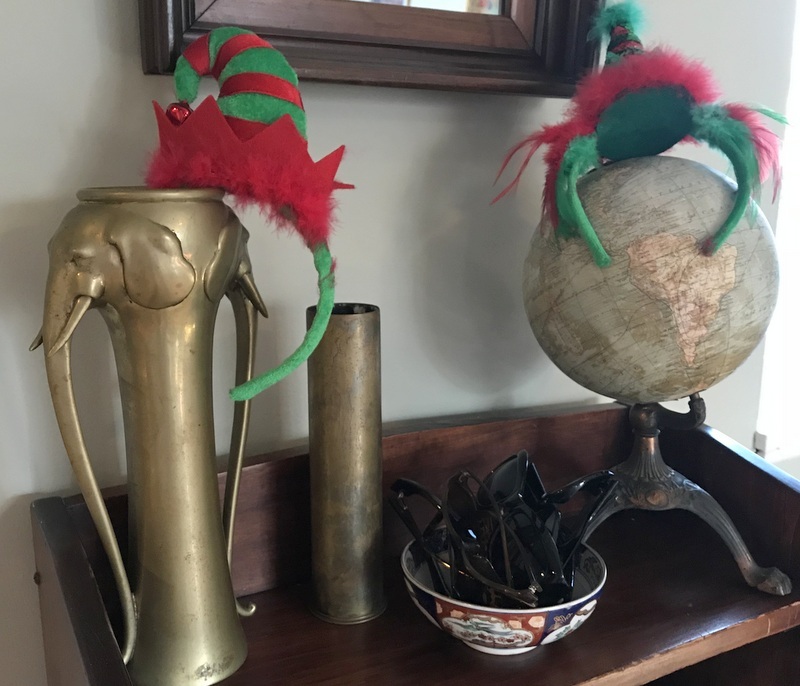 UPDATE: I just noticed the most Christmasy thing in my house are the Santa’s Elf headbands on the bookcase next to the front door. They are so much fun to wear! Previous articleHelp a garden center get through the winter: buy a kokedama. Or an orchid. Or something. Who has time for that??? Exactly !!!! 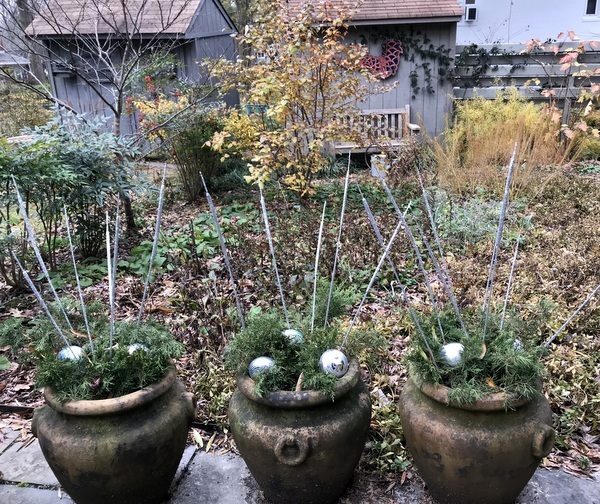 Always enjoy the pots with lights Deborah Silver, Dirt Simple, does for winter. They’re Christmas and beyond…worthy. One issue, skills/time/sourcing/cost, putting them together. Hopefully, once before I die, I will do a Deborah Silver winter pot, and keep it lit year round. Adore the simplicity of life, with aging. You did well. Others do nothing. Spring is coming again. I think what you did looks fine! If you’re happy with it, that’s all that matters. 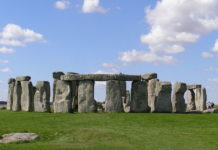 You did say you weren’t happy with the 3 look-alike pots – my suggestion there is that the middle pot needs to be taller than the other two. It keeps the group from looking static. You wouldn’t even need to get a different pot, just find something to sit the middle pot on to elevate it. Alternatively, if you space the pots out along a walkway or something, problem solved. Such a good idea to use redundant pots and just stick a few glitzy bits in! I’m not particularly artistic but I have a lot of pots left over from the summer that just sit around all winter. I shall put them to good use for Christmas and cheer up the exterior of my home. Tara, thanks so much for sharing the reference to Deborah Silver’s blog. 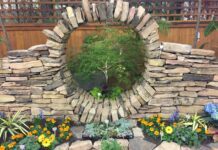 I’ve found myself starting with her first posts from 2009 and am working my way through….her writing and insights into both gardening, design and just life in general are absolutely beautiful and mesmerizing.